Gallery House Concerts Society started with a demolished wall and a purchase of a swack of folding chairs! Now we can seat an audience of 50. Many more upgrades make Gallery House Concerts a superb auditory experience, for example, a tickless clock, 2 inches of insulation, 200 crochet chair booties, and toilet seats that don't slam! Avenue talks about our 100th concert. CBC Eyeopener grills the Gallery. Swerve tells it like it is. BeatRoute divulges secret and updates their readers. Doors open at 3pm if the concert falls on a Sunday and 7pm the rest of the week. You have 30 minutes to drop your coat, stash your stuff, and find a seat. Sometimes there is a local opener who plays 3-4 songs. After a 40 minute-set from the headliner, we break to meet the artist(s) and check out their CDs, t-shirts and what have you. From 'hello' to 'goodnight' the concert is about 3 hours. We ask that you remove outside foot wear and store them on the shelves provided. There are felt slippers available for your use. Throw coats on the bed at the end of the hall. PRIVACY - If you have concerns about your image being captured on video or on camera, a house concert may not be the activity for you. Please understand that the Gallery, artists, and/or viewers may record the performance and include some of the audience. A small feature food item is available with a coin jar for donations. Please feel free to bring your favourite beverage and a snack plate to share. Coffee and tea are provided. TICKETS - If you wish to be invited to our home, please click one of the Tickets' buttons on our Home page. We will acknowledge with date, time, and location. If, three days before a concert, there are no tickets sold, the show may be canceled with the artist's permission. E-mail us with any questions. Space can fill up quickly. To guarantee your seat, payment must be received and acknowledged before the performance commences. Book on line, or call/text Jackie to make other arrangements 403 988-3106. Several have asked if they can pay at the door. We discourage this for several reasons. (a) We need to know ahead of time how many chairs to set up, how much coffee to brew, how many pizzas to bake, how many rolls of toilet paper to put out, etc. If we are not sold out, we do not put out all the chairs as they are just in the way of those attending. (b) We do not have the capacity to make change or take credit cards. (c) The artist frequently wants to know how many tickets are sold and we can not guarantee the cash-at-the-door folks. Please do not ask if we can "comp" you a ticket. It is not our money to give away. If you are a friend or associate of the artist, or are attending to audition the artist, kindly contact the artist directly who will let us know that a donation will not be expected. If there are particular seats that you would like to reserve, we will do our best to accommodate. The soft seats are popular and it's first-come, first-serve. In the event of a sellout, we remove all the big furniture to give everyone more room. Although we do not have a dog ourselves, there is a dog that visits us quite frequently -- she is often in the backyard during a concert. Therefore we have a fenced yard that will contain all but very tiny dogs. If your dog plays well with others and enjoys staying outside, you are welcome to bring him/her. If you have an allergy to dogs, you may not be comfortable. We encourage any concert attendee to intervene when the activity of another distracts the audience in any way. You are welcome to encourage that person to move to another room in the home away from the stage area. Shushing is allowed! Please limit cannabis and vaporizing to the garage or outside; and the smoking of cigarettes/cigars/tobacco pipes to outside only. Above all, people come to Gallery House Concerts to listen. We welcome closely-supervised children. Children must be absolutely quiet or must be removed from the listening area (downstairs or outside). 12-and-under are free of charge when accompanied by a ticket-holding adult. An adult donation is expected from those 13 and over. 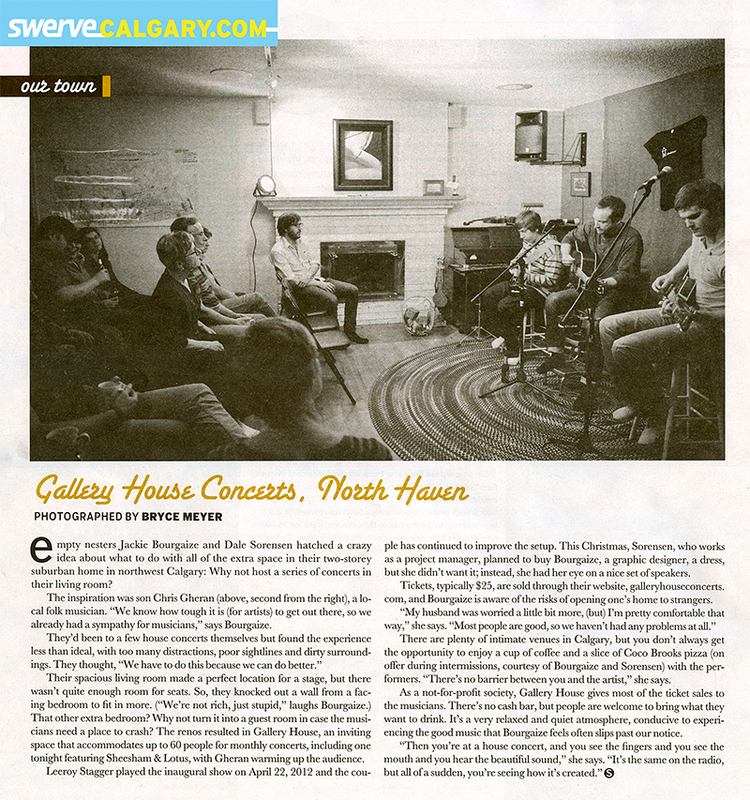 Gallery House Concerts was incorporated as a not-for-profit society on October 18, 2012. All proceeds go directly to the artists less a fund transfer fee if PayPal is used (about $1). Tickets are transferable but not refundable. FUND RAISING Occasionally we will organize a fund raising event or raffle to assist artists with travel expenses to other events. Tons of parking on the street or in the alley. Home address will be confirmed when acknowledging your reservation. To read about the directors of Gallery House Concerts Society, click here. If you have misplaced an item at one of our shows, look for it here. Use our chairs for your event. Suggested donation $1.50 per chair. If you would like to receive notifIcation of concerts, click here.